THIS WEEK’S TWO OTHER FEATURED BOOKS, “BURIED,” BY FRANK TROY AND “PERFECTLY NEGATIVE,” BY LINDA CARVELLI, CAN BE FOUND BY SCROLLING DOWN BELOW THIS POST, OR BY CLICKING ON THE AUTHOR’S NAME ON OUR AUTHOR PAGE. THE EDITOR: I’m thankful for the developmental comments from Kirsten Johanna Allen once the book found a publisher—and from my wife, Susan Cushman, from the very start. THE PUBLISHER: Torrey House Press, an independent nonprofit publisher of transformative stories that illuminate important facets of the American West and our ever-changing planet. Its tagline is Voices for the Land. SUMMARY: Leonard Self has spent a year unwinding his ranch, paying down debts and fending off the darkening. Just one thing left: taking his wife’s ashes to her favorite overlook, where he plans to step off the cliff with her. But perhaps he’s not as alone as he believes. Stark, beautiful landscapes attract all kinds. Artists and gawkers. Love birds and the lonely. Believers and scientists. Seekers and losers. Many have taken this same road past estrangement and loss to healing and hope. Though not all have returned, they can still help Leonard answer whether his life is over after all. THE BACK STORY: I started Monument Road in January 2009 with a premise based on a fragment of a radio transmission I overheard on a ride-along with my brother, a police officer in Grand Junction, Colorado. A woman who had a dispute with her boyfriend thought he might be headed up into the mountains to take his life. Although the story evolved from my original concept, I kept the image in my head of a man making such a lonely drive. As I worked, I also heard echoes of David Rhodes’s Driftless, which powerfully evokes an influential landscape and close community relationships. Western Colorado is where I was born and where family are buried. Coming back to it forty years later, I could write about the land and its people with both familiarity and distance. WHY THIS TITLE? Monument Road is the name of the actual road that twists to the top of Colorado National Monument, where much of the action in the story unfolds. Since I describe actual views and landmarks along the scenic road, it made sense to put real names in the novel. But even in the abstract, Monument Road speaks of an important journey and hints at the nature of the landscape Leonard will pass through. And a “Road” title places the novel in a distinguished company. WHY WOULD SOMEONE WANT TO READ IT? 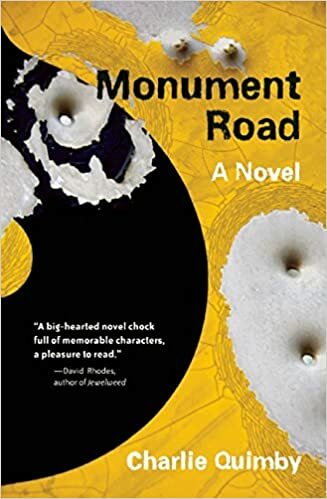 Monument Road is first of all a novel for readers who enjoy character-driven fiction. It features an uncommon love story that seems to appeal to men as well as women. Although bad things happen to some of the characters, the book is ultimately hopeful. Readers who enjoy fiction set in the contemporary west have found similarities with the novels of Kent Haruf and Louise Erdrich. Readers who have farmer uncles have wondered how I knew them. AUTHOR PROFILE: With a college background in theater, I began my career as a writer in the arts and later moved in marketing, where my specialties were executive speechwriting and demystifying complex information for a variety of industries. After meeting deadlines for 35 years, I sold to my employees the agency I’d founded and turned my attention to blogging and helping nonprofits raise money and influence public policy. After a few years of this early semi-retirement, I felt a need to take on something new and substantial. I’d never been serious about writing fiction, though I had started and set aside a novel in the early ‘80s. In 2009, without job or child-raising distractions in my life, I decided to see if I was up to the challenge. Monument Road was hailed by Publishers Weekly as one of the Big Indie Books for Fall 2013. Booksellers named Monument Road an “Indies Introduce” Debut and Indie Next Great Read and picked it for the Reading the West shortlist. It was also Booklist Editors Choice 2013 and a Colorado Book Award Literary Fiction finalist. AUTHOR COMMENTS: After Monument Road was published, I decided to write a sequel called Inhabited, which has an October 11, 2016 publication date. Meg Mogrin sells pricey houses, belongs to the mayor’s inner circle and hopes her hometown can attract a game-changing development. Isaac Samson lives in a tent, abhors disorder and believes Thomas Edison invented the Reagan presidency. Displaced by the towns crackdown on vagrancy, Isaac struggles to regain stability, while Meg contends with conflicted roles assisting the developer and serving on the homeless coalition. Then Isaacs quest to return a lost artifact intrudes into Meg’s tidy world, shaking her sense of security and virtuousness. This character-rich novel explores the dimensions of loss, the boundaries of compassion and the endurance of love. It’s an eerie experience to come out with a second novel after a debut that receives unexpected attention. Before, I had no reputation and no expectations. Now I have actual readers to please or disappoint, but in other respects, I have lost that interesting, virginal glow. I’m looking forward to the reception of Inhabited and hope it will induce readers to discover Monument Road. WHERE ELSE TO BUY IT: All the usual suspects online, including Barnes & Noble and Amazon for print and e-books, as well as iBooks and Kobo can help you.